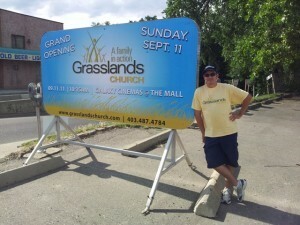 Grasslands Church, a new Grace Brethren church being planted in Alberta, Canada, launched this morning at 10:15 a.m., welcoming more than 165 men, women and children to the Galaxy Cinemas in Medicine Hat. Pastor Oliver’s message was on “The End of Religion” and it seemed to be received well, with good feedback and fellowship. The children had a great time beginning “The High Seas Expedition” as their theme, and they had singing time, game time, and learning time. Edwards continued, “We had people pitching in from all over – a couple of friend drove in from Lethbridge (about 90 miles away) to serve with our children’s teams. A new family to Medicine Hat from New Zealand served as ushers. We also had helpers from other churches in Medicine Hat help fill out where we needed help – it was an amazing experience. Pray for the connections that need to be made with new visitors. Pray for encouragement in our core team as we begin the hard work of sustaining what we have begun. Pray for Pastor Oliver and Pastor Bart as they continue to build momentum in teaching and worship. Pray that many of the people who came today desire to continue and build connections in this new community.